There’s a bit of see-sawing when it comes to looking at plaid as an element of fashion. On one hand, it’s style suicide if not worn properly – the word ‘lumberjack’ comes to mind, which if you’re not in the profession is not exactly a compliment, or at best, a well-dressed Scots highlander claiming his clan’s presence. On the other hand, coordinate it well and combine it with a scarf, skinny denims and so on, and you’ve got yourself an ensemble that could classify as punk, plaid, nostalgic, grungy and so on – given the correct accessories. These colours ought to remind you of the cool mystery cartoons on Cartoon Network! 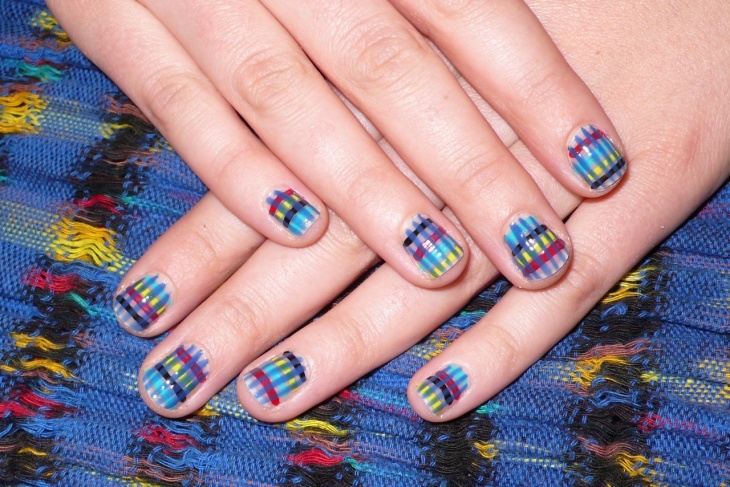 The same palette looks just as entertaining on your nails with this multicolour plaid nail design. Apply a clear base coat to really make them stand out. Remember the Scottish highlander? 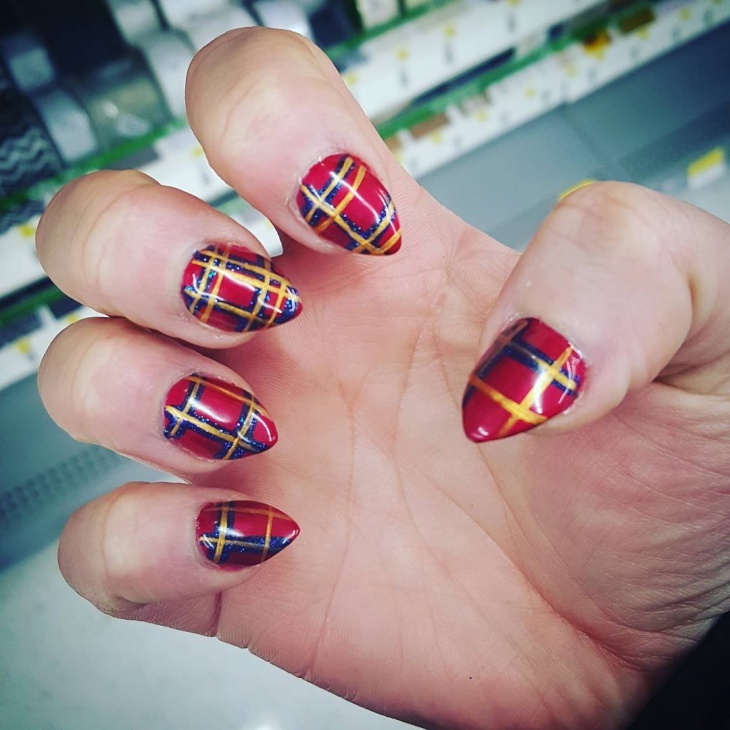 It’s definitely a heritage to be proud of, and you can tote the tartan on your nails with this pattern. This is black and brown nail polish nail art. 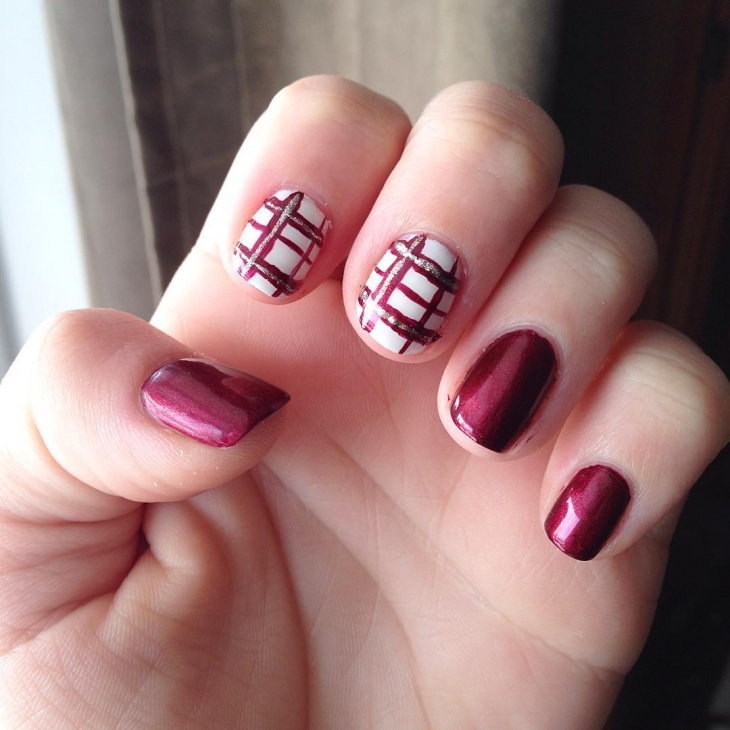 A maroon nail polish works for the darker stripes. The lines also need to cross off centre. 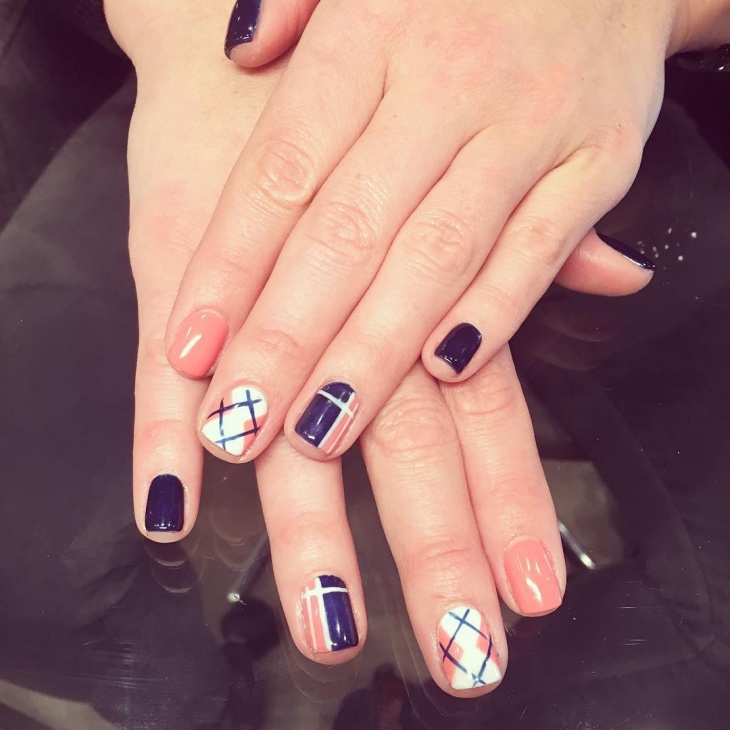 This plaid nail design for short nails is a cheery take on the French flag. 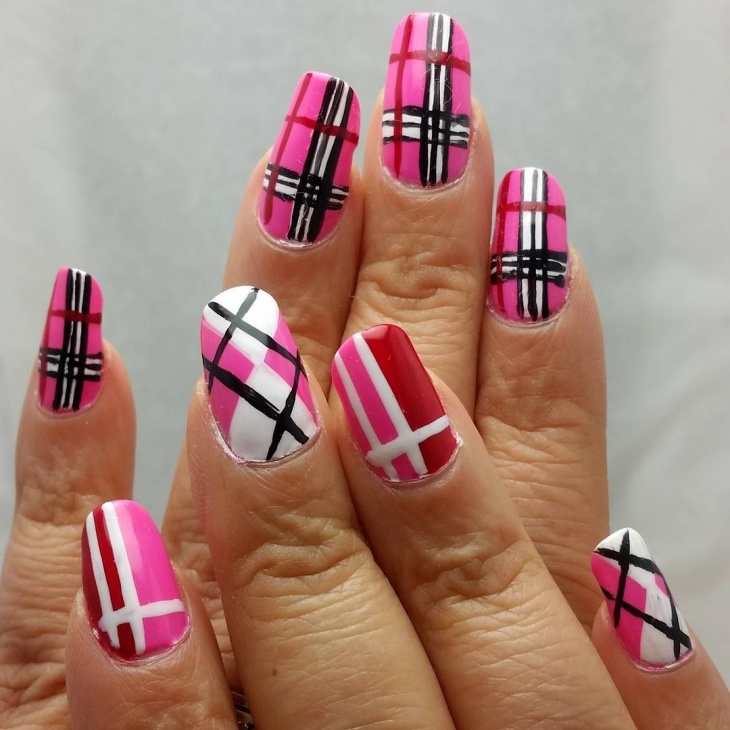 Use a thinner nail brush to outline the white stripes. It may look preppy and neat, like a schoolgirl’s uniform but that one bed of sparkling aquamarine is enough to liven things up! 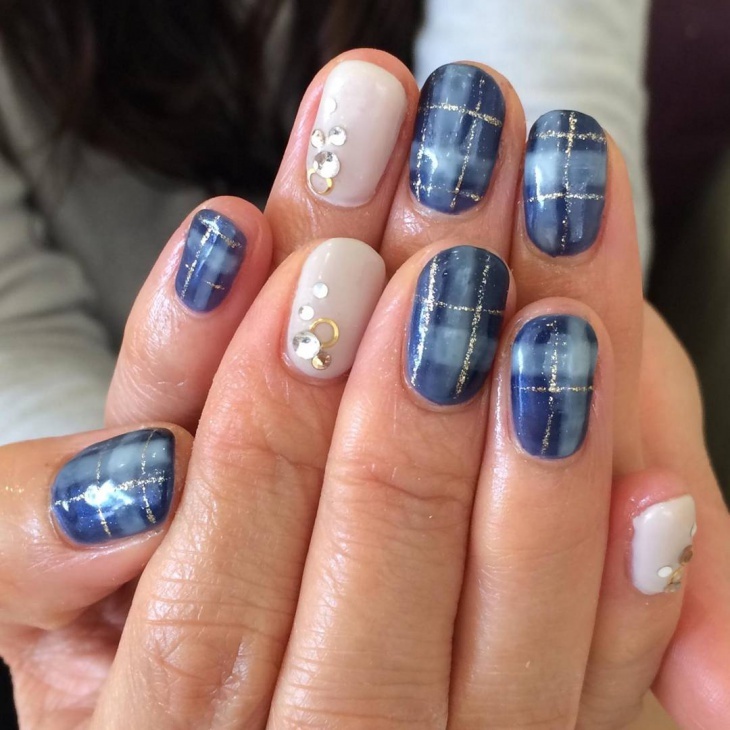 Check out this blue gel polish nail art. Five of them, to be exact. 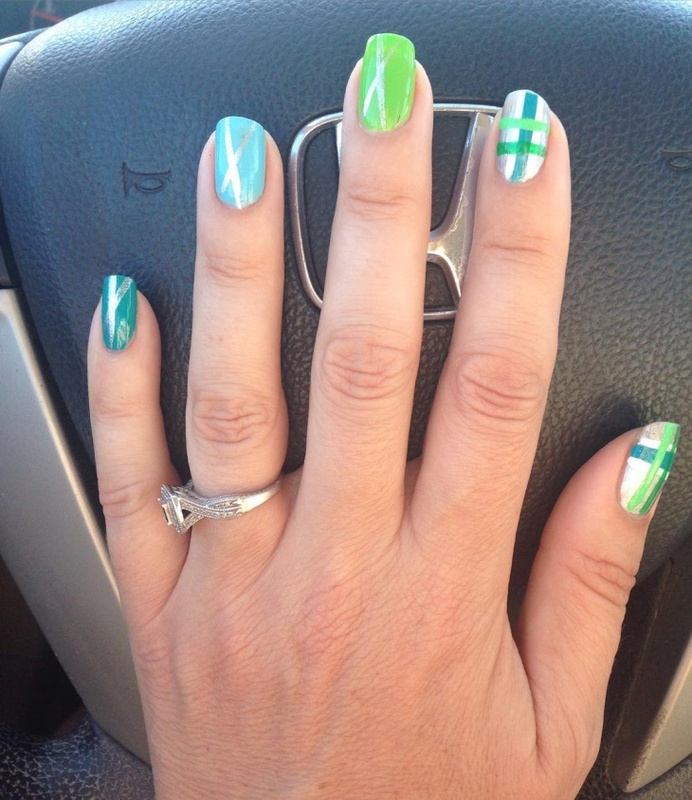 This green chequered nail art idea combining fresh blues, greens and whites ought to put you in the mood for some good sweatin’ for health. 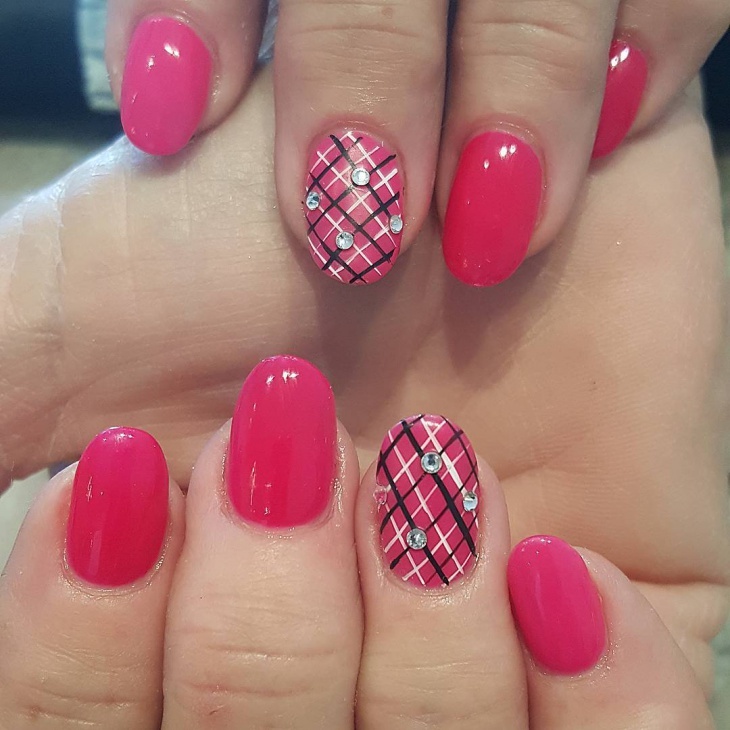 An alliteration to convince you just how much fun and playful these beautiful pink nails with plaid design look, complete with rhinestones! Use a less-than-bright shade of red for this – perhaps not tomato ketchup-esque, but definitely anything lighter than oxblood or burgundy, which are in fashion. 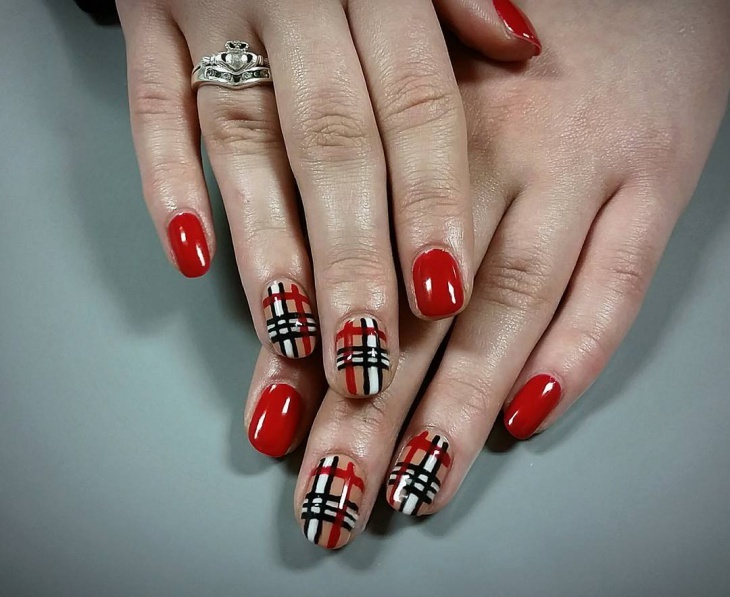 The plaid in this red spring nail design certainly add the spring in this other monotonous bit of nail art. 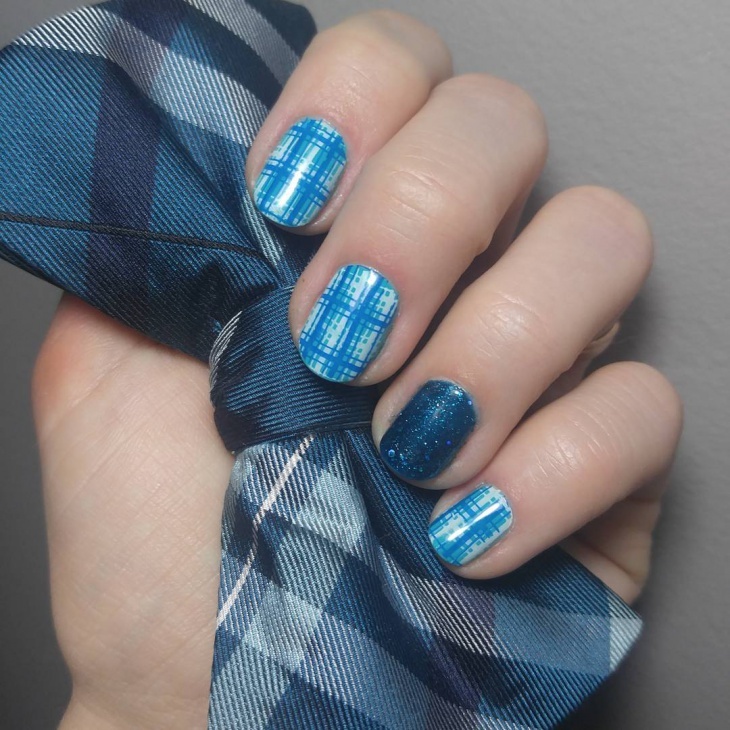 Glitter and plaid? Yes, please! Here are some ideas that combine the two perfectly. 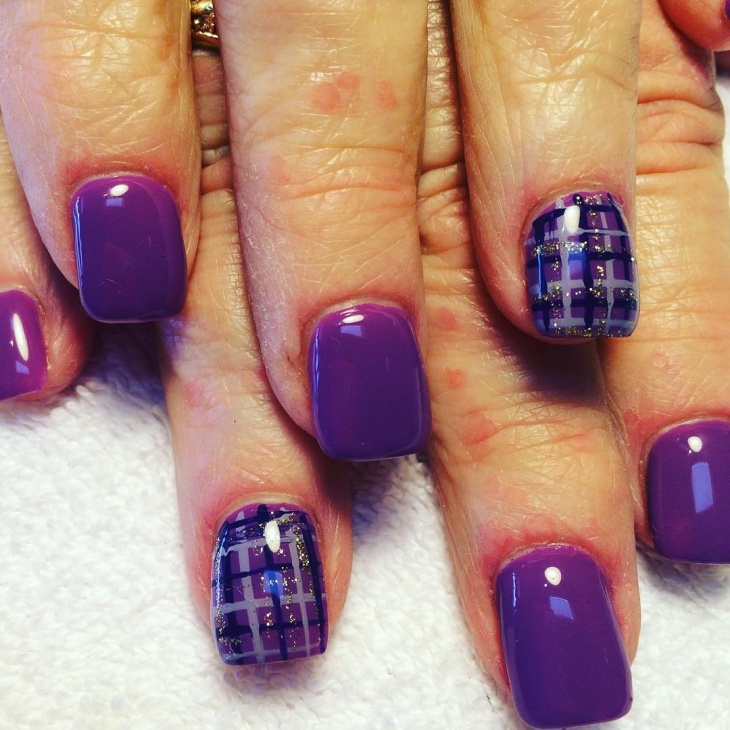 The purple plaid nails with gold glitter above need a light touch with a thin nail brush or a toothpick for the glitter. Best to use muted shades so that the glitter stands out. Why lucky? 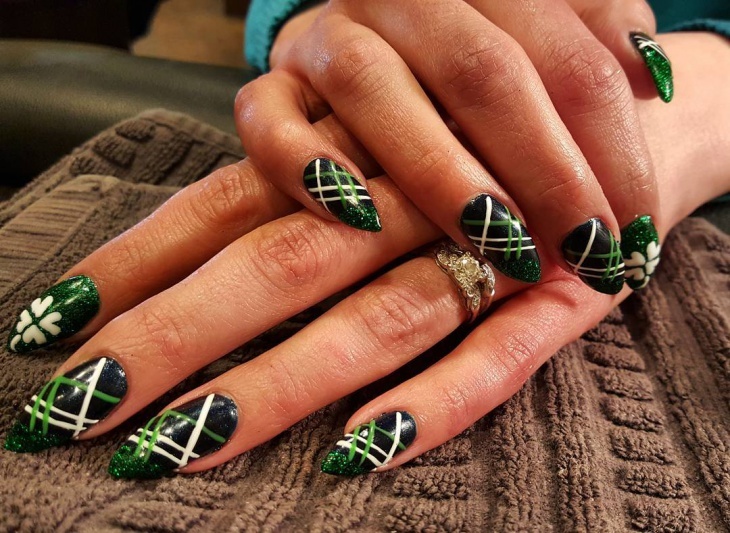 This black and green pointy plaid nail art also adds a white four-leaved clover for good fortune! To set your design, add a clear top coat before and after applying them, so as to avoid any smudging. And accessorize with a small ring! 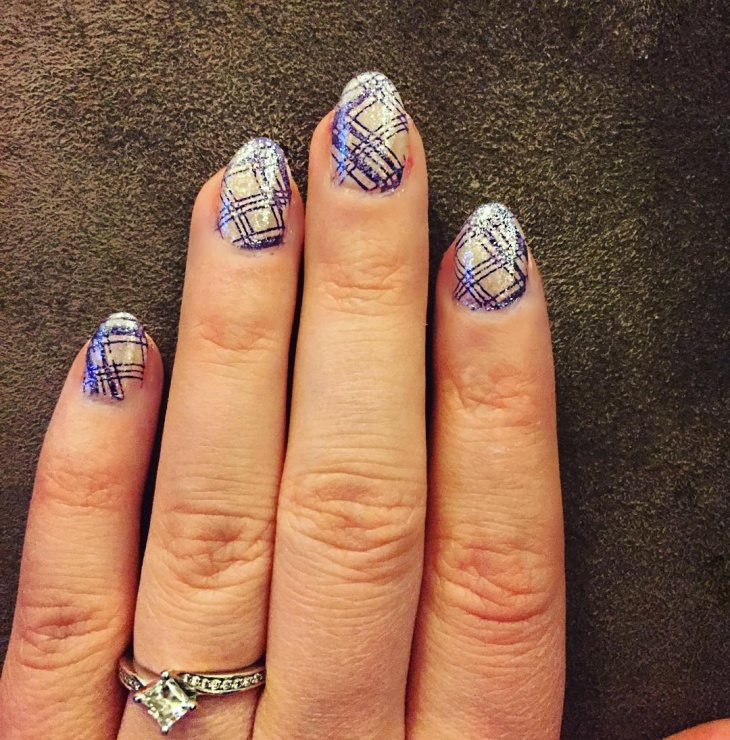 The glitter certainly takes centre stage with this blue and silver glitter nail design. 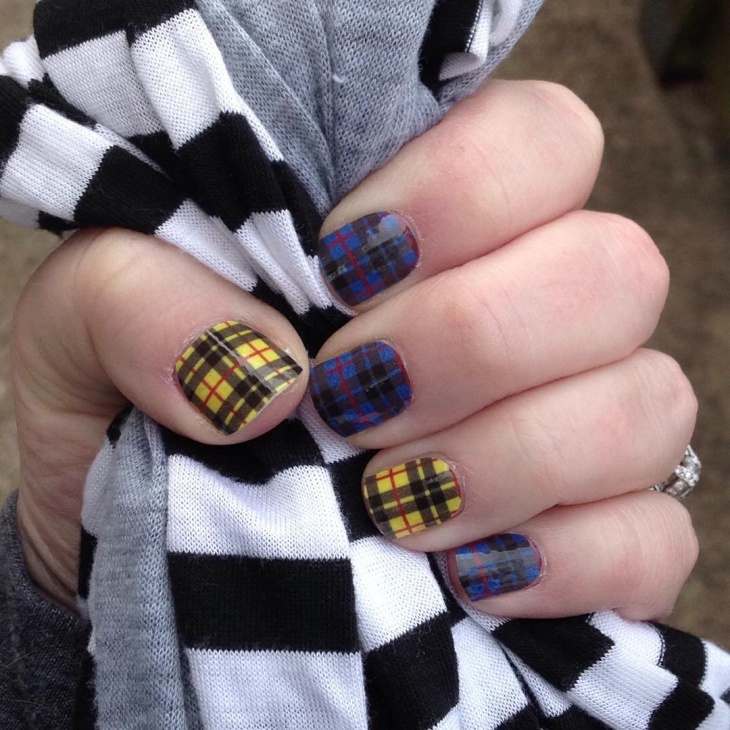 Apply a clear top coat before following with the plaid. 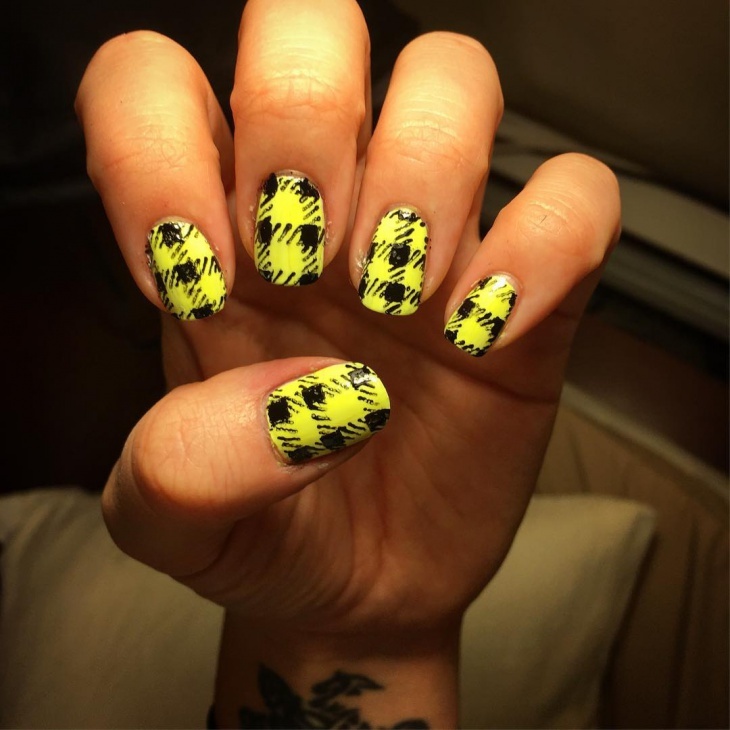 So there you are, plaid nail art designs for the preppy, grungy, fashionable (Scottish?) punk in you! 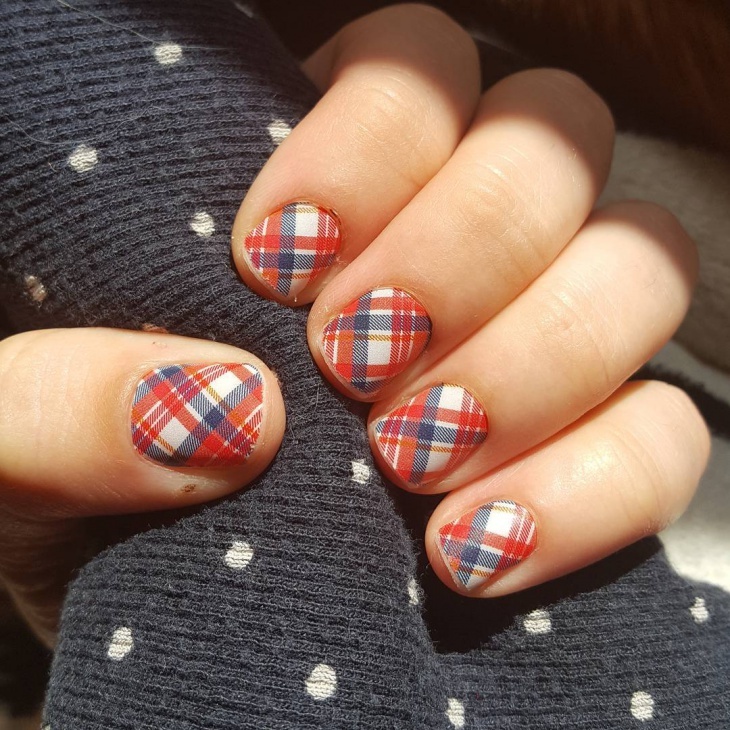 For that’s just how versatile plaid can be. The important thing to remember here is to not add too many elements while working with plaid – it throws an onlooker off what they’re really supposed to concentrate, while confusing them simultaneously. Style is about working with different elements, but with a single goal in mind. 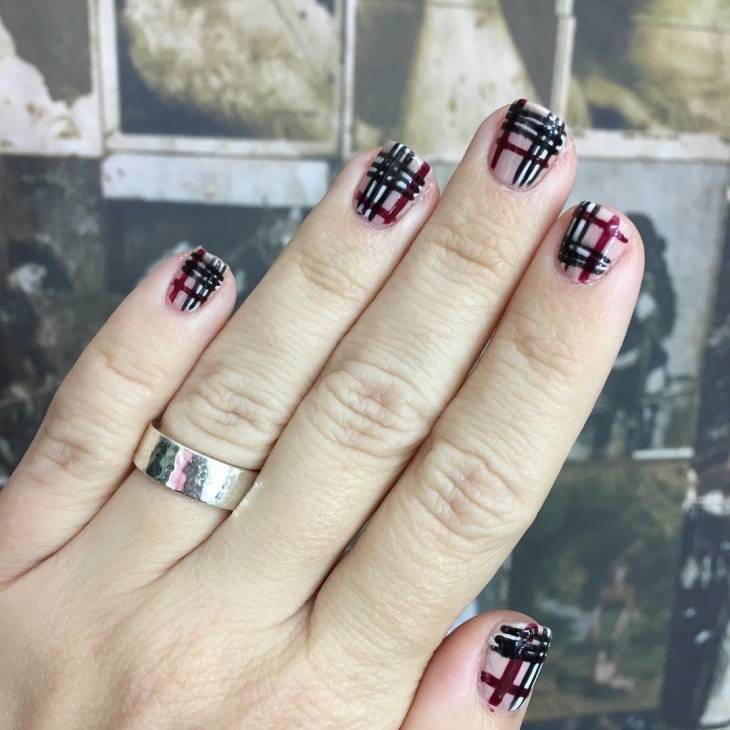 No one wants to look like a hot mess, and your nails are included here! 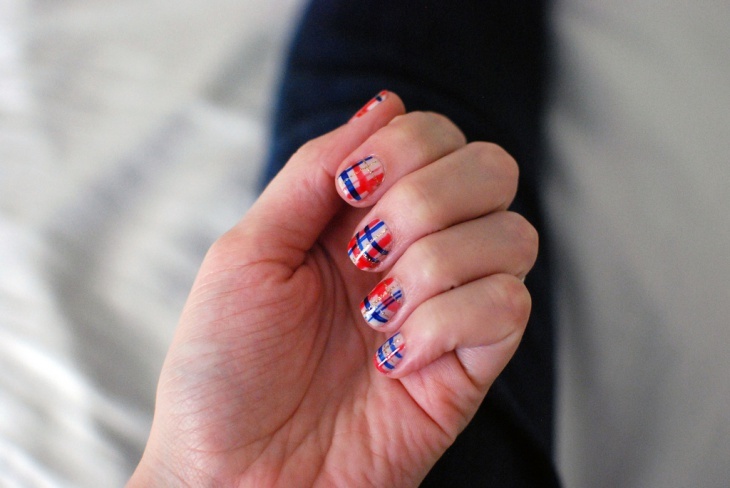 Celebrities who glory in the diversity of nail art include the Kardashian-Jenners, Kelly Osbourne and Katy Perry. Hope these tips have helped!